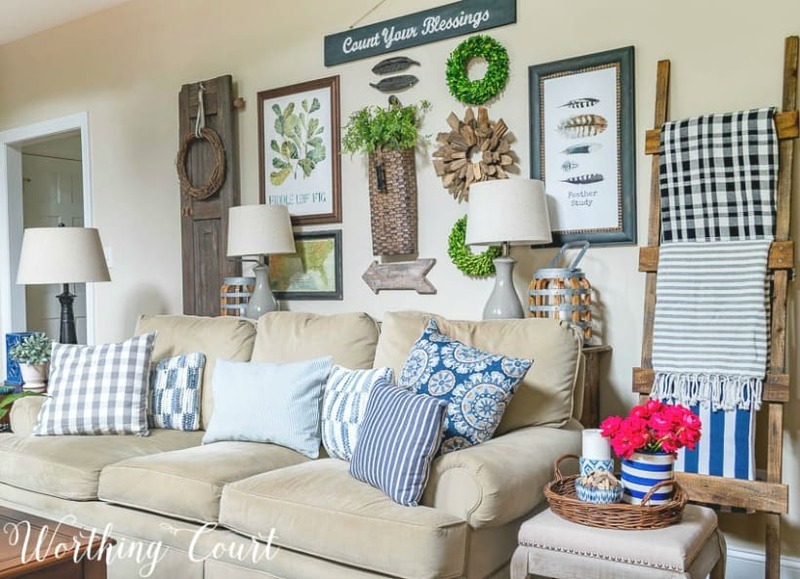 Find out why trays are the ultimate home decorators weapon. 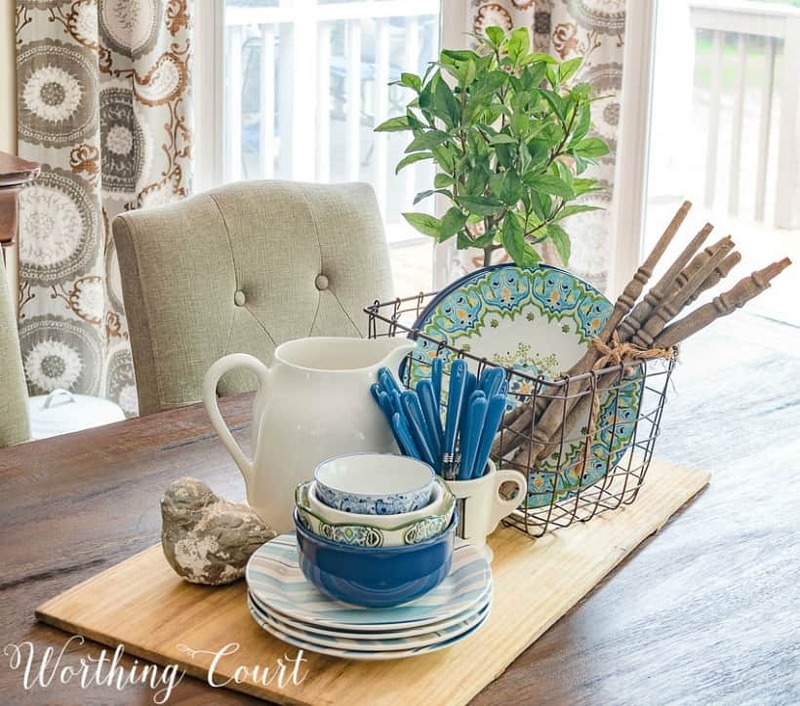 Whether decorating the dining room table or a side table or any other spot, trays are one of the most versatile weapons in your home decor arsenal. Did you know that trays can be your bff in the world of home decor? I can’t get enough of them and you’ll usually find one in most any photo of my home. I guess you could say that I’m a tray collector and have them in a variety of materials, sizes and shapes to use throughout our home. Check out some of my favorite tips for decorating with this functional and flexible decorating staple. Don’t think that you should only collect large trays. I have quite a collection of small ones too and their small size makes them perfect for corralling a few items together to brighten a spot where a large tray just won’t work. An added bonus – using a tray on a stool like this one turns it into a side table of sorts, so that someone could actually use as a place for a drink when sitting on that end of the sofa. See the rest of my summer decorations HERE. OK – this technically isn’t a tray – it’s a breadboard, but it became a tray when I used it to serve as the base for a centerpiece on my kitchen table. 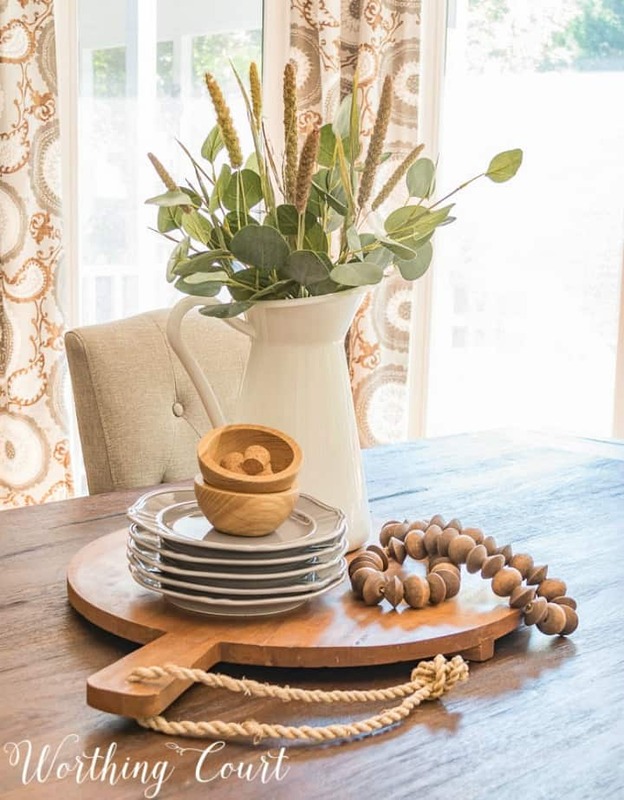 Nine times out of ten, you’ll find me using a tray to serve as the base of any centerpiece that I put together – it might be an actual tray, a breadboard or maybe just a table runner. Any centerpiece or vignette always has more presence and looks more ‘important’ and cohesive when the components are grouped together on a base of some kind. If you’re unsure of how to create a unique centerpiece like this one, you can find step-by-step directions HERE. You’ll be able to pull items from your stash and apply the same principals explained in the tutorial for your own table. Because it’s confined, it’s easy to think that you should only include small pieces within a vignette for a tray. I say pooey on that! 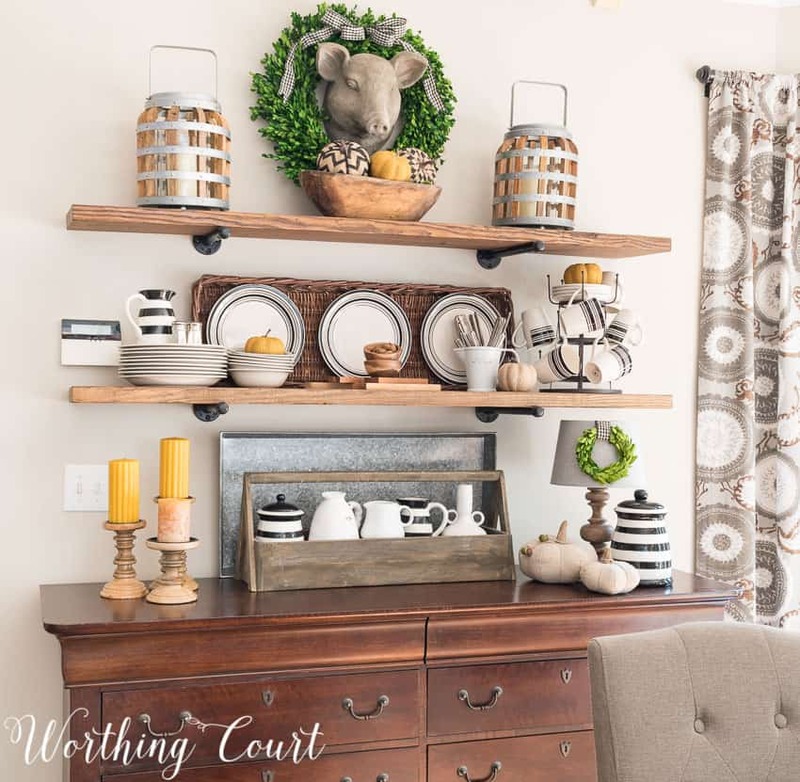 Now of course it depends upon how large your tray is, but using substantial pieces grouped together looks great and makes a more noticeable statement than if you only used several small items. Just be sure to vary the height and shape of the pieces that you use. 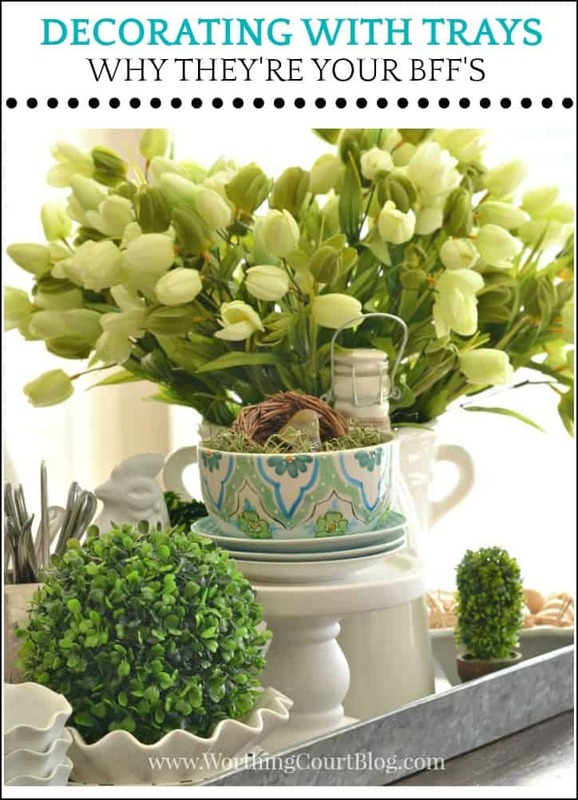 And remember the rule of three’s – whenever you create a vignette, you should always include at least three items. It’s true that things arranged in groups of odd numbers are more appealing and memorable. Take a tour of the rest of my screen porch HERE. 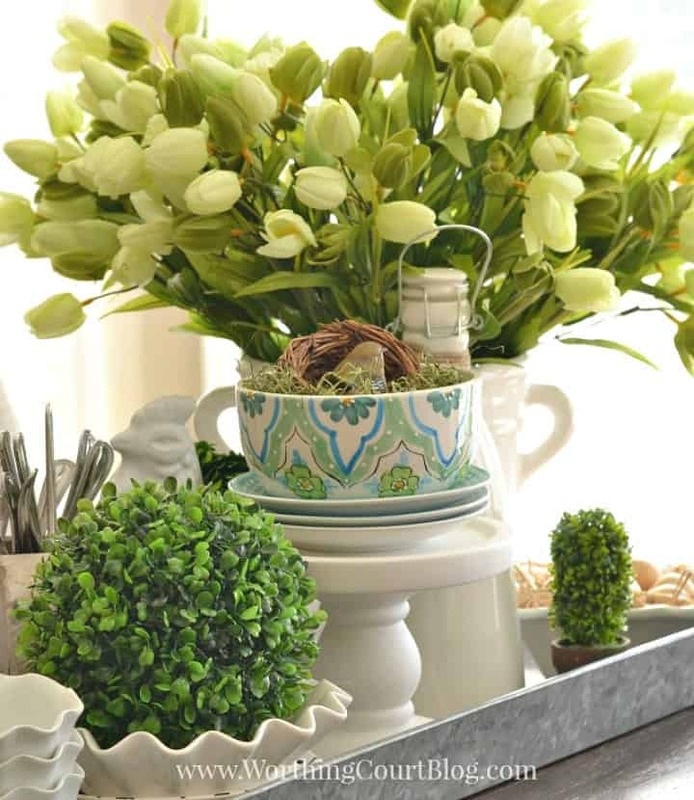 Here are two examples of one of the easiest ways you can use a tray as part of a centerpiece. Again, depending upon the size of your tray place three appropriately sized items together and voila! 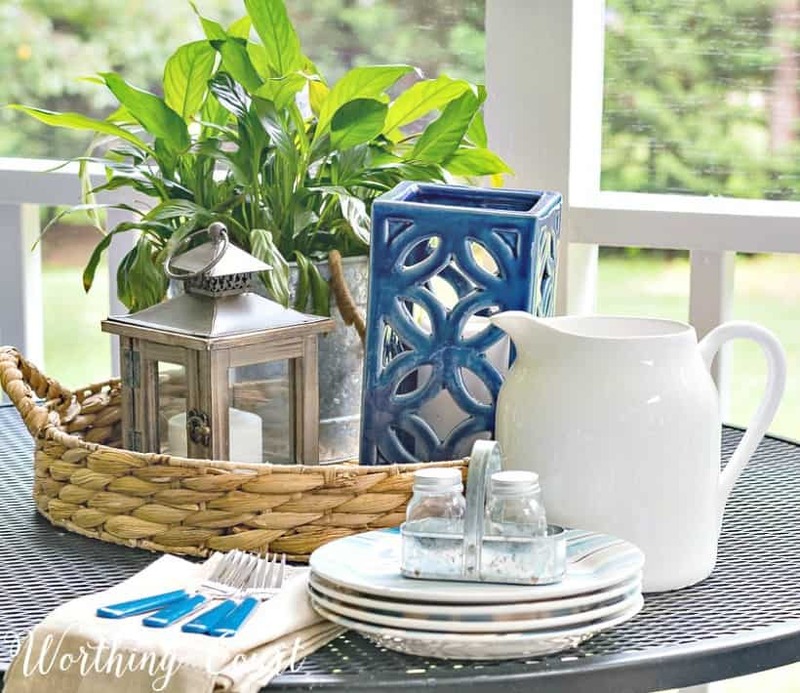 – instant centerpiece in five minutes or less. Get more centerpiece ideas HERE. 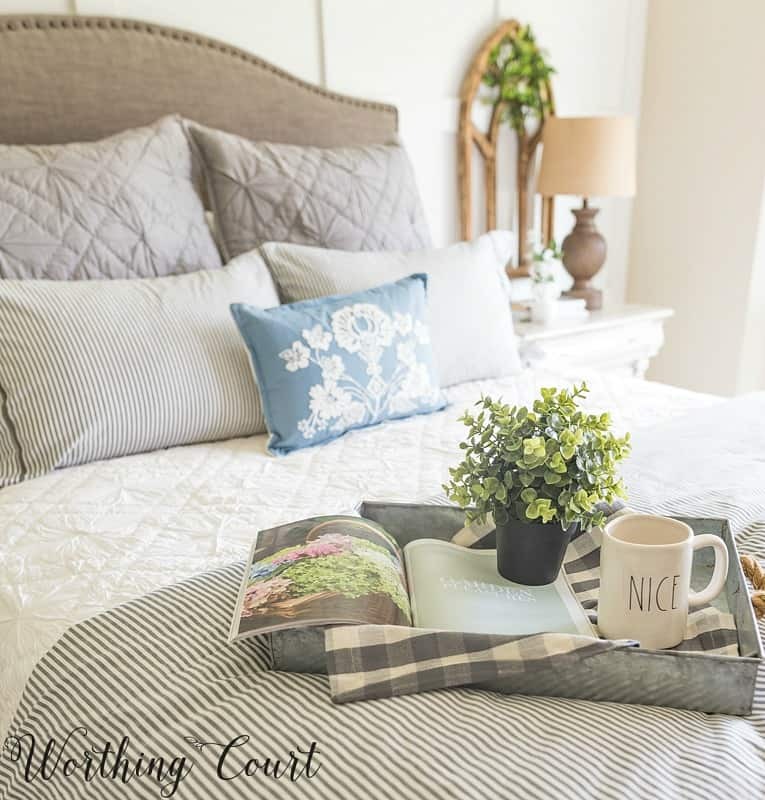 This tray placed on the bed in my guest bedroom is styled for photos, but imagine it filled with essentials for your overnight guests. What a great place to corral special soaps, reading material, a couple of bottles of water, some chocolates and other niceties. When putting together a guest room tray, I’d also include a little framed printout of our wifi password. You can keep anything organized with the help of a tray. We’ve all seen specialty organizing trays for bedroom dressers, nightstands and for the inside of drawers – right? But – try thinking about organizing in plain sight and still keeping it a part of your decor. 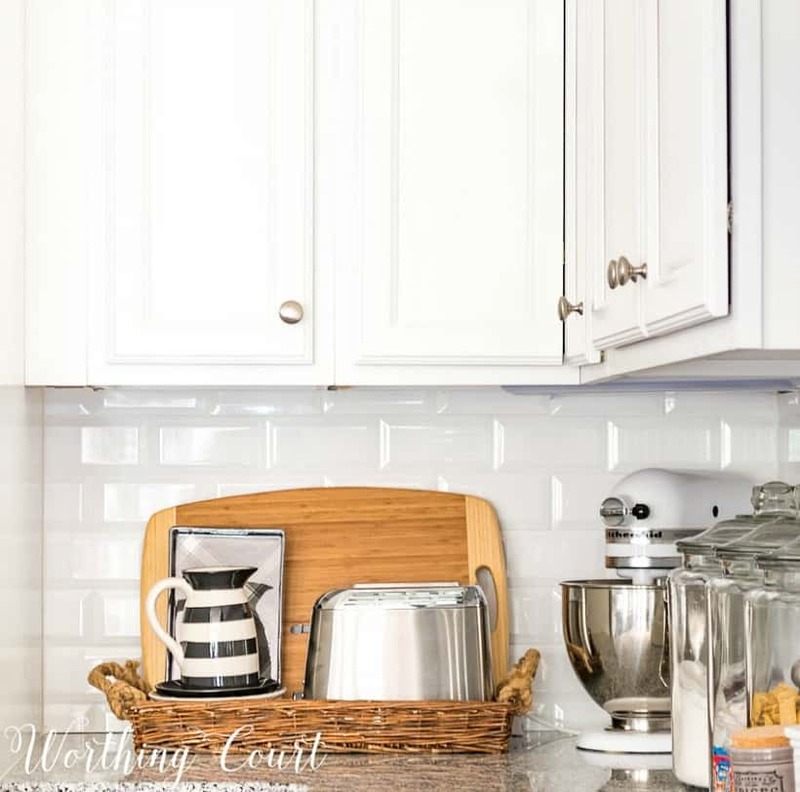 I use two different trays on my kitchen counters – one to hold my cutting boards and toaster and another to hold my cooking utensils and dog treats. All items that I want at my fingertips, but look so much prettier arranged in a tray. See the before and after of my remodeled kitchen HERE. 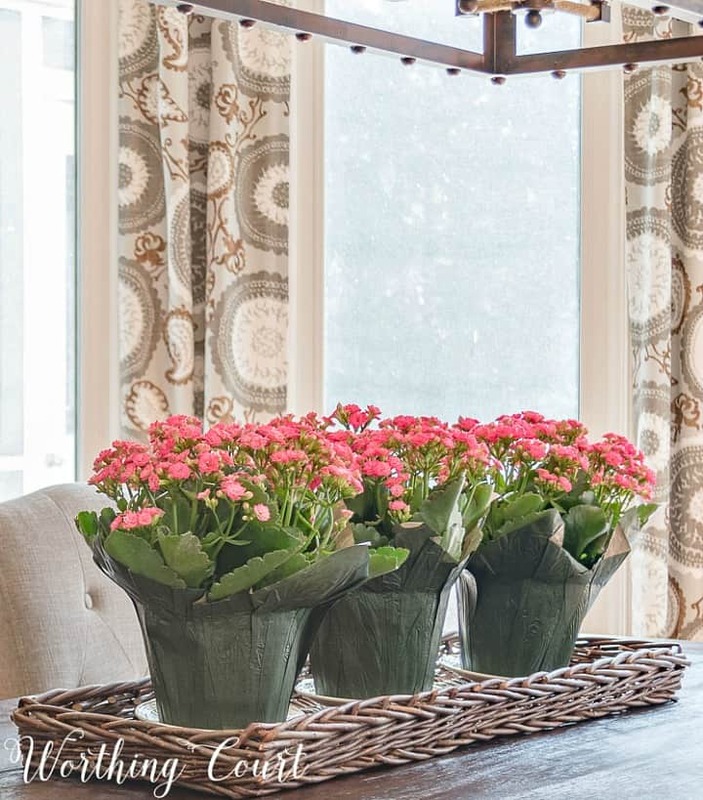 It doesn’t matter if you’re using your tray as a base for a centerpiece or to create a display somewhere in your home, there are three elements that you should always include: varying heights, texture and empty space. Varying heights add interest, texture adds depth and a bit of empty space keeps the tray from looking like it’s crammed full with just a bunch of stuff. Reproduction toolboxes are pretty easy to find in home decor stores and online and they are super versatile. I keep one of the sideboard in my kitchen almost all of the time and just change out what I display in it, depending upon the season. I’m not fond of seeing a lot of empty space in the back of bookcases or on the back of open shelves. It just feels empty to me when I see too much wall. 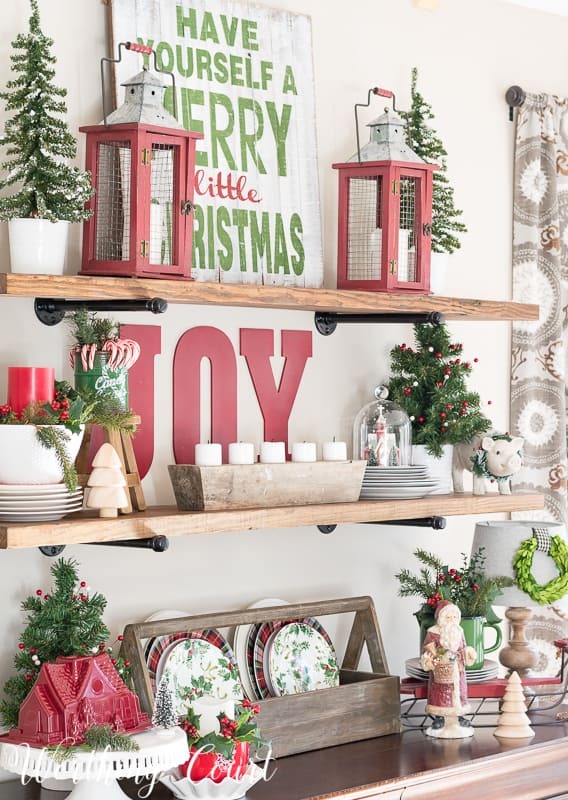 Using a tray as a backdrop to the decor gives the whole display a completed look. 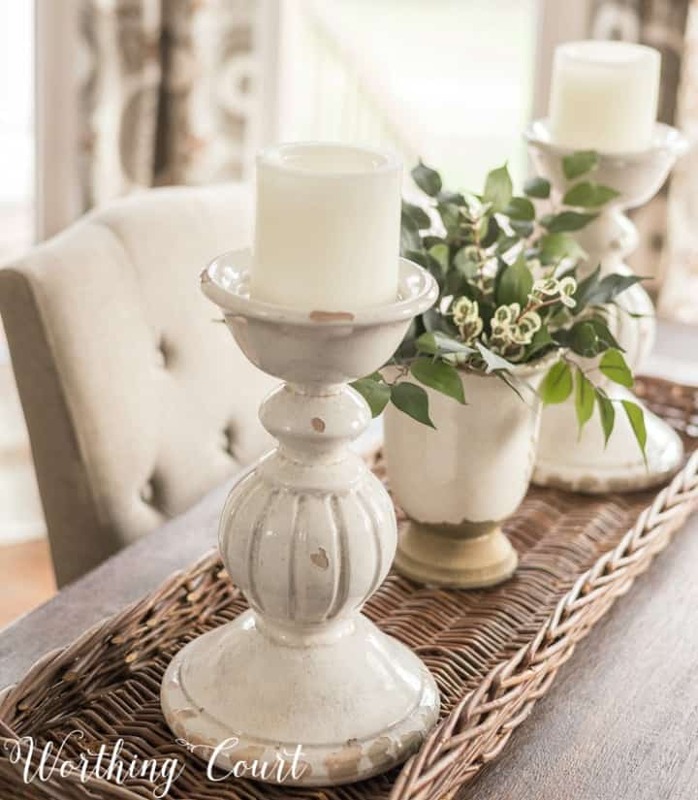 Trays come in many shapes and sizes – round, square, rectangular, with sides and without, in metal, wood and wicker – they’ll truly be your decorating bff if you’ll let them! Fabulous post. Have under used trays although that is how I corral the items in our bathroom. His for his side, hers for my side and ours for the space between the two sinks. Love this post! Wish there was a source for all the trays and baskets! Me too! 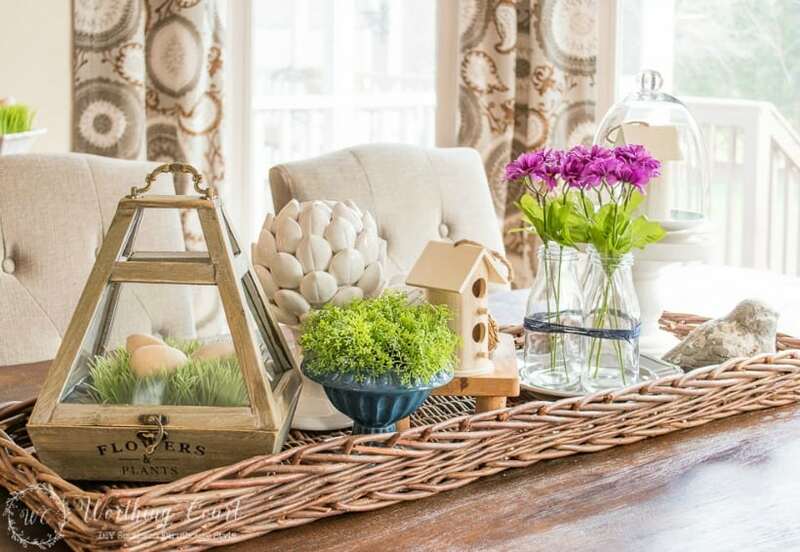 I would love the long rectangular basket tray for my dining room table! Couldn’t agree more about trays and use them everywhere in my house whether to make a seasonal vignette or just to keep things like books,magazines and the daily mail tidy. I am always on the lookout for a new unique one. My latest find was a large bamboo tray with sturdy wooden handles just perfect for transporting food and drink from house to deck in the summer. Thank you for your great photos and ideas. I love using trays. I really enjoy seeing how you use them throughout your home. Great ideas! Love this post, Suzy! And I planned on pinning it for future reference and also to read more of the links you provided! Love your post! You have a knack for making ANYTHING look great!!! These decorations are adorable! I always admired tray decorations but never know how to do it. Thank you for sharing the post.